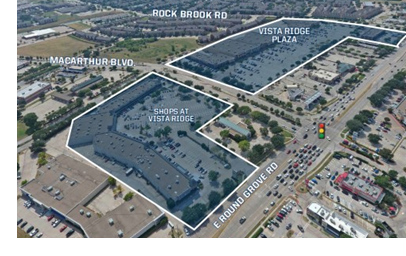 ​​​​​​​ LEWISVILLE – Lamar Companies acquired two Class A shopping centers: the Shops at Vista Ridge and Vista Ridge Plaza. The properties total approximately 292,000 sf and are at the corner of FM 3040 and McArthur Blvd., approximately 0.25 miles west of I-35. The centers are anchored by Bed, Bath and Beyond, DSW, Burke’s Outlet, and Pier 1 Imports. The properties are located approximately 20 miles north of Downtown Dallas, 25 miles northeast of Downtown Fort Worth, and less than ten miles from the DFW International Airport. ​See also: Dallas-Fort Worth-Arlington Retail Market Research​.